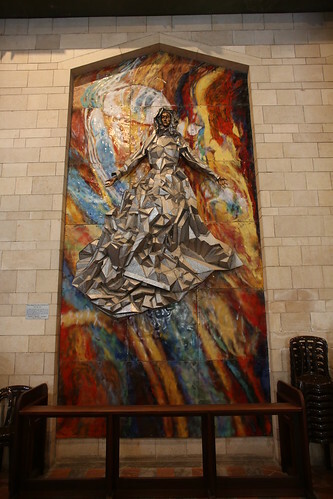 NAZARETH (April 9, 2013) - The Basilica of the Annunciation in Nazareth. On the second day of their pilgrimage, Cardinal Seán and the priests visited Nazareth, the place where Jesus grew up and the home of Joseph and Mary. Cardinal Seán and a group of 29 priests of the Archdiocese of Boston have traveled on an Easter pilgrimage to the Holy Land this week, and they're bringing the readers of TheGoodCatholicLife.com blog along with them. All this week, our colleague George Martell is traveling with the pilgrimage, embedded with the Cardinal and his priests so we can bring you photos, blogs, videos, and audio reports from the Holy Land from the pilgrims at such places as the Basilica of the Annunciation, Mount Carmel, the Sea of Galilee, the Church of the Transfiguration, Qumran, the Mount of Olives, the Church of the Holy Sepulchre, the Upper Room, and more. This once in a lifetime opportunity to walk in the footsteps of Jesus with Cardinal Seán and the Archdiocese's priests as an Easter retreat experience. Please stay tuned to www.thegoodcatholiclife.com, as well as www.BostonCatholicPhotos.com and www.YouTube.com/BostonCatholic and our Facebook Page at www.facebook.com/bostoncatholic and Twitter account: www.twitter.com/bostoncatholic for the latest updates from the Holy Land.